Scientists at the the École polytechnique fédérale de Lausanne, Switzerland claims to be able to stimulate the spinal cord of paralyzed mice with an appropriately electrical stimulant so as to control his limbs immediately. As reported by Cnet on Monday, September 29, 2014, a research project named NEUWalk and has been tested and proven to move the damaged rat spinal cord. The project motivated the idea that the human body needs an electrical signal in order to function. This project becomes important when the electrical signals of the brain responsible for moving the spinal cord is interrupted due to spinal cord damage. That is, the electrical signal paralyze parts of the body. However, the electrical signal is sent directly to the spinal cord and not through the first brain signals sent to replace the brain, as the team at EPFL, led by neuroscientist Grégoire Courtine, has discovered. The workings of this project is to cut spinal cord and make some mice paralyzed parts of the body underneath. Then, a team of scientists put electrodes into the spine flexible right at the cut nerve. This allows scientists to send electrical signals to the damaged bone. However, this method is not sufficient to make mice run leg. That is because, the way the brain sends electrical signals are not purely arbitrary shaped flow, but more towards the measured frequency electrical stimulation that can set certain gestures mice. By studying all aspects of how electrical stimulation affects the movement of the feet of mice, such as gait, a team of scientists were able to find a way to stimulate the spinal cord to be able to pass through obstacles such as stairs. "We have total control of the hind paws of rats," said Courtine. 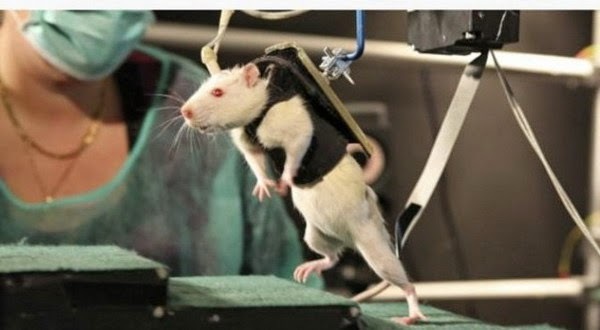 These mice do not have voluntary access to his limbs, but the injured spinal cord can be activated to stimulate their natural gait. We can control in real time how the rat moves forward and lifted his legs, "he said. Clinical trials on humans can be started from the beginning of June 2015 The team plans to begin testing to patients with spinal cord injury using a research laboratory named Gait Platform, located at the University Hospital of Lausanne, Switzerland. This laboratory contains a custom treadmill and other support systems, such as fourteen infrared camera that reads the sign on the patient's body and two video cameras to record the movement of the patient. Silvestro Micera, co-author and neuroengineer says the importance of this discovery. "Simple scientific discoveries about how the nervous system works can be deepened with the purpose of building a neuroprosthetic technology more effective," said Silvestro. "We believe that this technology may someday significantly improve the quality of life of people affected by neurological disorders," he added.